I was thrilled when I was asked to be a guest blogger for the McMaster Alumni Association. Being a recent grad (class of ’11), I have wanted to learn more about Mac Alumni and the events and resources that are offered. This event was part of Mac10, which brings together McMaster graduates from the last decade. Along with helpful career events, there are also nights out such as this one. It was great to meet Alumni Officer Erin O’Neil and have my first post-grad event with the university. It was serendipitous that this particular Mac10 event was a concert at Hamilton Place featuring the Hamilton Philharmonic Orchestra. I have a long history with the venue and it always feels so familiar to be in that space. 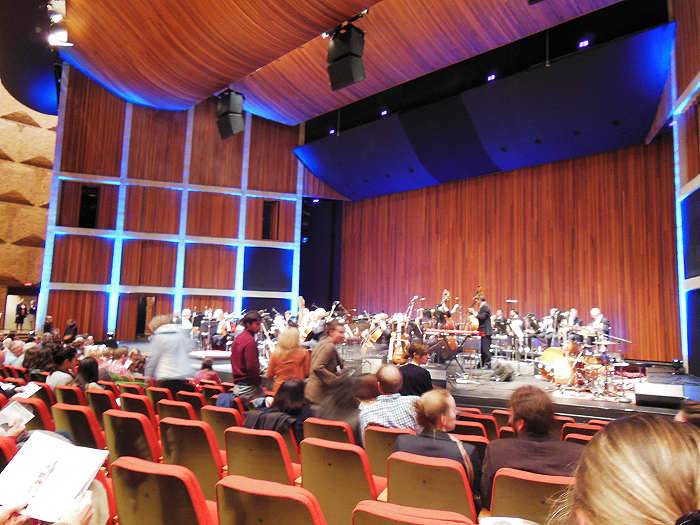 Some of my earliest memories of live music are attending HPO’s Pops Series with my parents, at as young as 5 years old. A few years later I was performing on that same stage in my dance recitals, and last year I got to walk across the stage again to receive my diploma (Ryan Gosling was in the audience; no biggie). Here I was again with a group of alumni to watch a performance by HPO. Full circle, indeed! 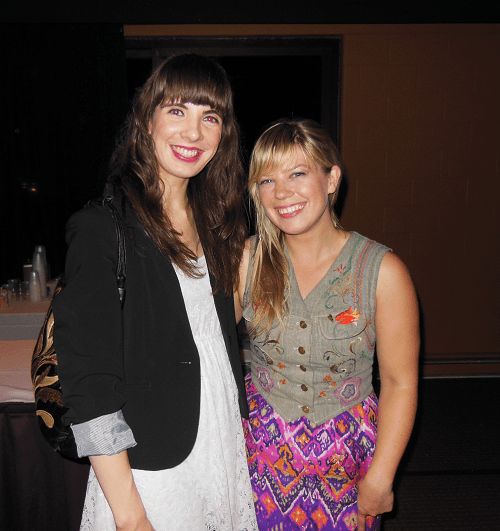 This concert was the first of the 2012/2013 Pops Series and welcomed the Canadian gem Basia Bulat who performed with the HPO. Basia’s songs were arranged for the orchestra by another amazing Canadian talent, Owen Pallett. I was unfamiliar with her music beforehand, and having listened to Basia’s music prior to the event, I knew it was going to be a special night. 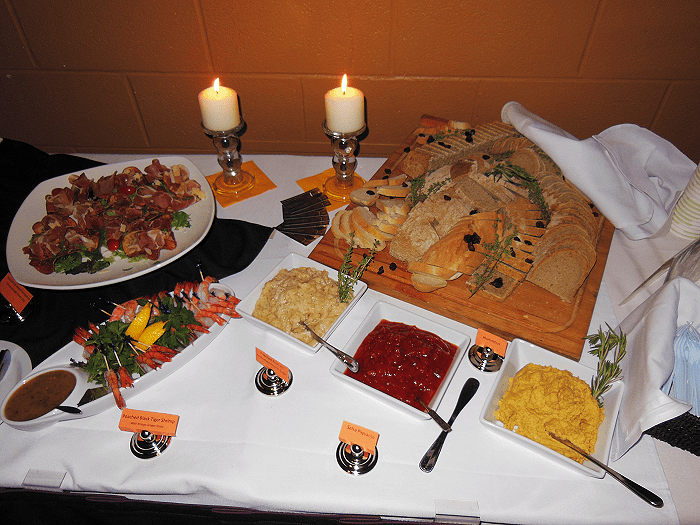 Before the show, we were treated to a reception catered by Incognito Restaurant and Wine Bar. The restaurant has been on my checklist, not only because I have yet to visit, but incognito is just such a great word, isn’t it? The food was delicious and artfully presented. I think the stuffed mini potatoes were a collective favourite. Over drinks and appetizers, I got to chat with Erin and more fellow Mac alumni. This event brought together people from all different disciplines and various levels of study. Some were recent grads, like myself, and a couple were currently pursuing their masters and even PhD. Making the day even more filled with Marauder spirit, the homecoming game was that afternoon, which saw a victory for our home team. Settling into our seats, we had a fantastic view of the stage and there was an exciting energy in the air as the musicians took their places. Leading the HPO was conductor Martin MacDonald, whose banter at the beginning of each act was just as entertaining as the intensity of his command of the orchestra. This was Basia’s thrid time playing with the HPO and she noted that the first time she played with an orchestra was under Martin’s leadership. Adding to the multitude of musicians already onstage were Basia’s band – her brother Bobby Bulat on percussion, Ben Whiteley on bass, and Holly Coish on keyboard, ukulele, and backup vocals. The arrangements of Basia’s songs were awesome, and I say this with the true definition of awesome in mind – awe-inspiring and breathtaking. It was truly special to be able to witness the performance and it was so refreshing to be in a space where everyone was completely absorbed and lost in the music. Songs like “Heart Of My Own,” “Run,” “Gold Rush,” and “Snakes and Ladders” were all made into sweeping symphonies and were a pleasure to listen to. Basia also did a little storytelling as she weaved a narrative throughout her set list. Perhaps one of the most drastic changes that Pallett made to the original material was “I Was A Daughter,” which closed the show before Basia returned to treat us to a couple more. For this one, Basia stood and sang without playing an instrument and it was lovely to see her gestures as she expressed the song, truly embodying the music and lyrics. The most moving number of the night for me was Basia’s performance of “It Can’t Be You.” She performed her new song alone, accompanying herself on the charango (which looked like a ukulele with at least double the strings). As amazing and sweeping as the orchestral arrangements were, this one was a complete showstopper in its simplicity. The audience was quiet and still as Basia swiftly strummed, her voice belting out with so much emotion, filling the whole room. She stepped away from the microphone as the song progressed and her powerful vocals still carried and cut through the air, at times being the only sound. It was absolutely stunning. The song was met with the most vocal reaction from the crowd. While we anxiously await Basia’s upcoming album, check out this filmed session to get a taste. 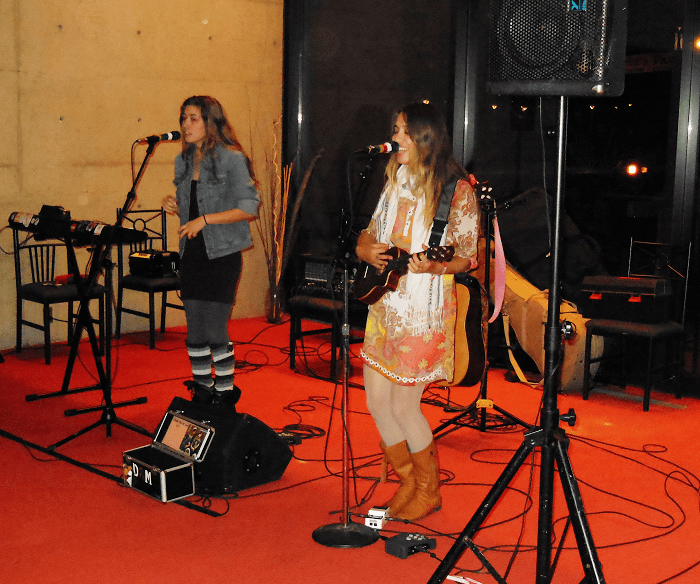 Another pleasant surprise was getting to see Dawn and Marra perform during intermission up on the mezzanine. They were the perfect choice for the night’s “Music on the Mezz,” offered by the HPO. The addition is a terrific idea to provide entertainment during intermission and showcase new talent. 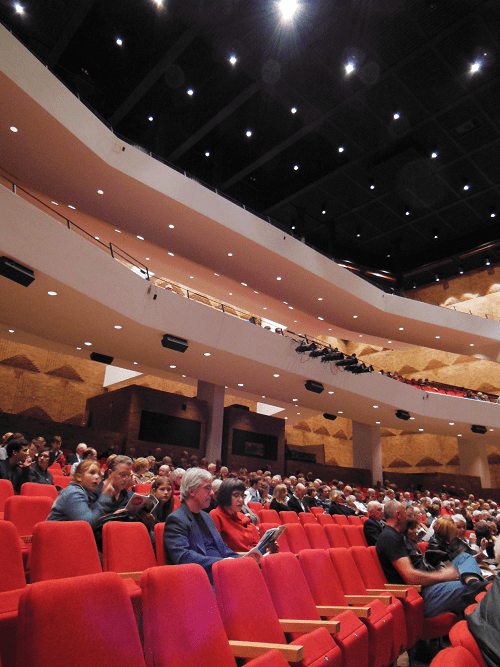 The girls are well on their way to performing up on the main stage with the HPO one day – I would love to see that. After the show, we able to have a meet and greet with Basia. We were all really excited to get to chat with her. Basia is so lovely and bubbly; I’m always impressed when an artist is so profound and incredible when performing, and in person is still so relatable and down-to-earth. She was so candid and sweet to speak with, which made it seem like we had known her all along. The most frequent question asked – when is her new album being released! Basia is just as anxious to release it as fans are to hear it, especially now after we were treated to some of her new songs at the concert. I’m grateful I had this chance to be introduced to Basia’s music, and what a way to be introduced! I want to thank Erin and the Mac10 team for inviting me to this event and for the opportunity to be a guest blogger. I look forward to future events and exploring the city more with the group!